Instead of fading away, the Used have returned from the brink of irrelevancy with their best outing in 8 years. It was hard to imagine the Used bouncing back from 2009’s Artwork. The band’s fourth studio album, and final with Warner Bros., not only failed to garner the attention or sales of their past releases, but also failed on a strictly aesthetic level. Resembling a mere shell of the band that once seemed to rule the emo/punk landscape, Artwork appeared as close to a swan song as one can imagine. Fortunately for fans of the Used, it appears that band still has life. After being picked up by indie label Hopeless Records, who as of late helped reignite Yellowcard and also put out one of 2011’s best punk releases in the form of the Wonder Years’ Suburbia, the Used returned to the loving arms of John Feldmann who produced the band’s first three albums. The resulting album, Vulnerable, is not groundbreaking, nor is it a complete return to form. It is, however, pretty good – which is a huge step in the right direction. 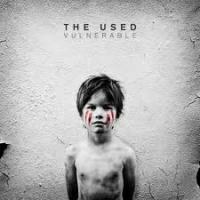 If you assumed that the drive inside vocalist Bert McCracken that pushed him into the role of the one of the most recognizable and thrilling voices in the genre was gone, you wouldn’t be alone. McCracken’s output on the band’s last few projects has been, simply put, boring. However, by the time the chorus of Vulerable’s opening track “I Come Alive” hits, McCracken gives an immediate reminder of what made his voice so special in the first place. Bordering on pop, but refusing to go over the edge due to his spastic screaming and semi-controlled aggression, Bert’s ability to pull melody from chaos is as good as it’s ever been. And speaking of great choruses, tracks like “This Fire” and “Hands and Faces” will remain stuck in your head for days thanks to the band’s always-present, yet somehow still unexpected pop sensibilities. Unfortunately, as has always been the case, McCracken’s firey vocals come packaged with a mixed bag of lyrical content. At times, he’s able to salvage his own words in the form of a catchy hook like that of “Put Me Out”, which features the lines “I gave you everything, you threw it away / Put me out like a cigarette, out like a cigarette." At other times, no melody on the planet is able to rescue a song such as “Shine”, whose profound chorus of “It’s my time to shine, do it my way, cause it’s my time baby / It’s my time to burn, start a fire, be the one and only” leaves you with no choice but cringe and skip to the next track. Always earnest, McCracken has made a name for himself by wearing his heart on his sleeve, even when that very act results in output that is far from sharp. The good news is, when McCracken comes up short, the rest of the band is usually there to pick up the slack. Vulnerable pulls off the somewhat unlikely task of incorporating some of the more experimental sounds of the band’s past two releases into a heavier framework reminiscent of their debut self-titled album or In Love and Death. “I Come Alive” serves as exhibit A, with an unorthodox intro that builds into an engaging combination of electronics and guitar. The spacey intro on “Now That You’re Dead” leaves you on the edge of your seat before kicking into a ferocious punk rock track while the guitar work on “Kiss It Goodbye” is simply delightful. Sure, there’s hiccups in the form of the unnecessary ballad “Getting Over You” and the strange, almost-dance-y track “Give Me Love”, but considering the recent output of the band, these mistakes are quite forgivable. There’s no shortage of bands that spend the majority of their careers chasing the impact and notoriety of their early days, and the Used seemed poised to be poster boys for the genre. There’s no mistaking that the band’s move to a new label accompanied with their continuously rabid fan base have helped in reigniting a spark that appeared to be lost. Vulnerable is not perfect, and frankly, it shouldn’t be expected to be. There’s a recovery process following any sort of disastrous event that involves time and steps taken toward full recovery. Instead of rolling over, the Used have begun taking the necessary strides back towards relevancy in the post-punk scene. With Vulnerable, they’re off to a good start.